Relational databases still have many use cases. Either being able to handle complex aggregations of time series, dealing with sums, products, either over all tuples or with moving windows. RDBMs are unbeaten handling huge sets with a relatively small number of joins. There has been quite the renaissance of SQL and RDBMs in the past years (and the presenter of this talk might not be innocent here), but there’s one type of store whose qualities are not beaten by RDBMs: Graph Databases. Graph databases like Neo4j have several features that no other store has. They are the first choice if your application deals with a lot of real relations, stores object trees that should be queryable and much more. Objects corresponds to nodes and relations are just that. Neo4j facilitates the use of both through its query language Cypher: An easy to learn, pattern matching query language. 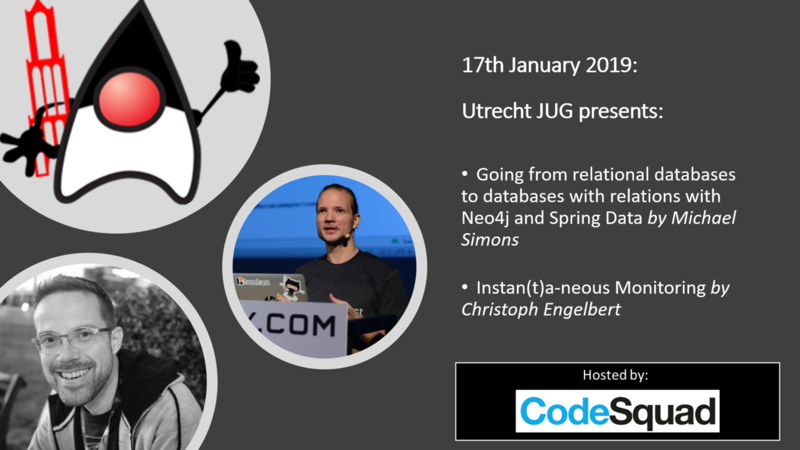 In this talk I’ll present my approach to Neo4j, Object Graph Mapper (OGM) and Spring Data Neo4j (SDN), coming from a relational background. I’ll explain the building blocks of SDN, present different ways to to turn some or all of your relational data into a graph and access it from a Spring Boot based application. Father, Husband, Cyclist and also a programmer: He is a software developer who likes many languages, but Java the most. He wrote the first German book about Spring Boot and works on Spring Data Neo4j and Neo4j OGM at Neo4j. He shares his knowledge on his personal blog and in Java User Groups. Michael founded the Euregio JUG (EuregJUG) in the 3 borders area of the Netherlands, Belgium and Germany. In the summer of 2018 he was announced Java Champion. Christoph Engelbert is a Java Champion and Senior Developer Advocate at Instana and an open source enthusiast and always interested in “Java Next”. In his spare time, he struggles with performance optimizations, the JVM internals or the garbage collector, whereby he is also available to answer questions on these topics as a freelance consultant. He also firmly believes in Polyglot and is familiar with Java, Kotlin, Go, TypeScript and other languages.